Qantas’s fourth Boeing 787-9 Dreamliner aircraft will sport a unique Indigenous artwork livery when it enters service in March on the airline’s domestic and international routes. The design is based on a 1991 painting by Anmatyerre artist, Emily Kame Kngwarreye, whose name will also be adopted for the aircraft. Indigenous-owned design studio, Balarinji, adapted the artwork to an aircraft livery. “As the national carrier, we’re thrilled to showcase another piece of Indigenous culture on one of our aircraft, and to reiterate our ongoing commitment to reconciliation with Aboriginal and Torres Strait Islander people,” said Qantas Group CEO, Alan Joyce. This is the fifth aircraft Qantas has painted in Indigenous designs and its only Dreamliner to sport such a livery. However, the aircraft will be only the second “flying art” aircraft currently in service, joining a Boeing 737-800 named Mendoowoorrji, that features the artwork of late West Australian Aboriginal painter, Paddy Bedford. Registered as VH-ZND, the new Emily Kame Kngwarreye Dreamliner is set to be delivered to Qantas on March 2 in Alice Springs, before flying to Sydney and Melbourne for crew familiarisation flights. The aircraft is set to permanently fly on international routes from late March onwards. Qantas took delivery of its first Dreamliner in October, which debuted on its Melbourne-Los Angeles route. The airline has a total of eight new aircraft on order from manufacturer Boeing, and will base the first four at Melbourne and the final four at Brisbane. Australia’s flag carrier has already confirmed that its Dreamliners will fly its new route between Melbourne and San Francisco, which will launch later this year, along with its Brisbane-Los Angeles service from September 1 this year. Qantas has worked with Indigenous owned design studio Balarinji for more than two decades on aircraft livery projects and other design work, including the Peter Morrissey uniform of 2003. The original Yam Dreaming artwork is currently located at Campbelltown Arts Centre in New South Wales. 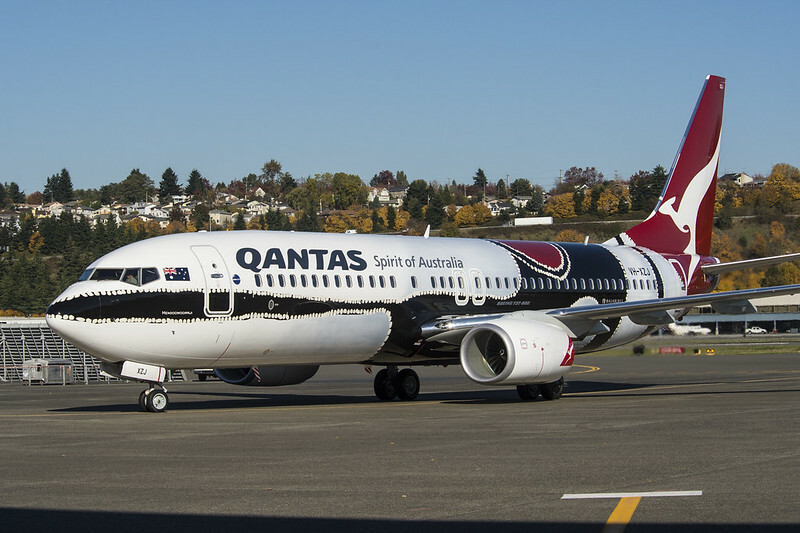 Five Qantas aircraft have been painted in Indigenous designs, with Wunala Dreamingcarried on two separate aircraft – click here for more information. Born in 1910 at Ahalkere in the Utopia Homelands, Emily Kane Kngwarreye is recognised worldwide as one of Australia’s most significant artists of the late 20th Century.